It is 1 o’clock in the morning, rain is breaking through the forest canopy. It is pitch black, and I am just about to wriggle out of my jungle hammock to check pitfall traps … again. This experience was not due to insanity, but for science. Specifically, my aim is to observe when distinct species of dung beetles are most active to better understand their role in the ecosystem. This task is just part of the research I am carrying out on dung beetles here at Osa Conservation. 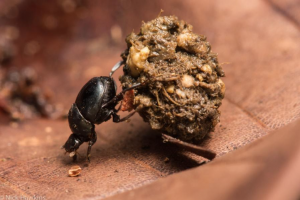 Dung beetles are very important in terms of ecological function within a tropical forest. They provide waste removal, soil aeration, nutrient cycling and secondary seed dispersal. All dung beetle communities are dynamic, relating to environmental features, habitat type, spatial distribution, dispersal capacities and interspecific interactions. Dung beetles are awesome as an indicator group, as they are super susceptible to changes in their environment. 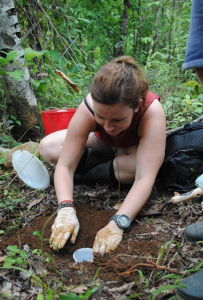 Understanding the dung beetle communities in different forest types can be a useful monitoring tool in reforestation projects. 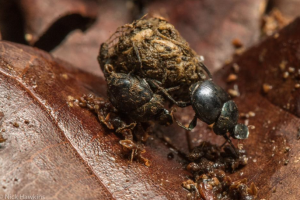 Dung beetles serve as a reference point of forest health and help set what we call a “primary forest baseline” which gives a restoration goal to work towards as we continue our studies. The research we are conducting helps us to understand how the mechanisms that cause dung beetle diversity to decline are linked to changes in landscape structure and mammal populations. As the demand for palm oil plantations here in Costa Rica grows, this information could be very useful for the conservation of biodiversity, especially here in the mega diverse Osa Peninsula. Dung beetles are often overlooked, but they have so much to offer. Not only do they benefit the ecosystem they live in, but they give people like us a better understanding of the effects of the changes we cause.